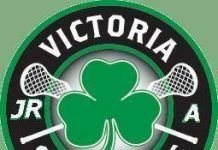 If game 1 was any indication, the Victoria Shamrocks now know they are in a battle against the Burnaby Lakers as they head into game 2 in Burnaby Thursday. The Lakers played the Rocks tough during the season but in game 1 of this series, they had a full line-up for the first time. Victoria was in the same boat with Jesse King back for the duration. While the Shamrocks took an early lead in game 1, the Lakers fought back and Victoria didn’t put the game away until late in the third. Things were very physical and there will likely be more of the same, especially in Burnaby’s home arena. Look for the Shamrocks to rebound and get back to playing their game instead of letting Burnaby dictate the way the game was played. The Lakers picked off numerous Victoria passes and forced shots wide. The Rocks are very capable of playing the fast transition game and moving the ball quickly. Both teams have a tandem of capable goaltenders so the series could be a long one. Game 2 is sometimes pivotal in these series. Having a 2-0 lead would be a huge advantage for the Shamrocks. Both teams will return to the Q Centre Friday at 6:00 pm for game 3. The game is available on Pay Per View from www.victoriashamrocks.com under the Fan Zone tab or follow on social media.